Surely one of the hardest things in a novel is to find authenticity of perspective. This is why so many novels feature main characters who are struggling authors trying to write a novel. Or sometimes, struggling professors of literature, trying to write a novel. Perhaps this tendency plagues English-language writers more than those from other cultures. I have always thought it hard to imagine a Tolstoy, a Borges or even a Parmuk emerging from a creative writing class at Middlebury College. On the other hand, if you want to read a book about a struggling would-be author taking a class at Middlebury college…. Ok, enough caricature. Summertime is a good moment to catch up on some reading, so here are two books that I find intriguing, not so much for being particularly well-written, but more for the extraordinary perspective of their characters they provide. What Is the What (Dave Eggers) and War Trash (Ha Jin) are both memoirs: not of the typically unreadable, "and then I had lunch with the Prime Minister and afterwards went to see Hamlet" variety, but rather wound upon the welcome spindle of professional wordsmiths, especially Ha Jin. Eggers filled up his book with silly tricks, literary nosegays, and other needless distractions. Despite all that, his book was still surprisingly readable (indeed, I almost finished it) and it garnered attention and critical praise. Follow-up has been, however, elusive. Which is why the story of Achak was a stroke of good fortune for the wayward memoirist. Having already told his tale (thereby exhausting his own creative well, it would seem) here was someone else’s tale to spin. And a fascinating yarn it is. Achak was one of the so-called "Lost Boys", children orphaned by the war who trekked across the Southern Sudan to refugee camps in Kenya. This is not a preachy call to action. The ongoing genocidal extermination being practised in Darfur is the ominous and oppressive backdrop to what is, really, a Bildungsroman. And the dispassionate and even-tempered tone only heightens the disgust the reader feels when faced with the atrocities of the Sudanese government and the inaction of paralysed Western governments. The memoir has flaws – brief, interlacing chapters set in Atlanta are an unnecessary distraction and can be skipped altogether (sign Dave up for that writing class at Middlebury!). But the events of Achak’s life are fascinating and provide an important antidote to the banality of suffering in our modern culture. I’ll mention as incentive the vignette of a young Japanese aid-worker who works closely with the refugee children and who dies one day in a road accident. The Sudanese children, their hearts swollen with grief and full of guilt, meet his grieving parents. But to their surprise, when they come face to face the parents bow in profound gratitude to them, for unknowingly they had given their son a consuming sense of purpose and filled his brief life with joy, which he had expressed in his letters home. War Trash is a novel by Ha Jin, a Chinese author who emigrated to the US after Tiananmen and who teaches at Boston University. (Ha sido traducido en español bajo el titulo de Despojos de Guerra.) 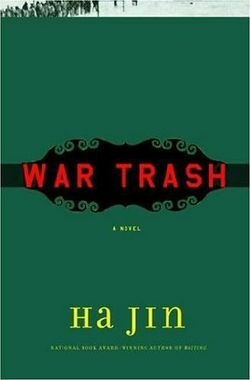 Winner of the presitigious PEN/Faulkner and shortlisted for the Pulitzer Prize, War Trash is also a "mediated memoir," insofar as it is based loosely on the experiences of the writer’s grandfather, reincarnated here as Yu Yuan, a cadet in the Chinese army who eventually finds himself involved in the fighting in Korea. The bulk of the book is set in a UN-run Prisoner-of-War camp, where tension between the Communist and anti- (or just non-) Communist factions is intense. The absurdities and petty cruelties of camp life are vividly drawn, and the central question – will the author accept repatriation to China (the Communist position), or be resettled in Taiwan (the Nationalist position) – is (odd as it may sound) an engrossing quandary and effective plot device. As with What is the What, the reader enjoys abundant small details that make this perspective – presumably unknown for a typical Western reader – thoroughly convincing. Finally, I would note the prose deserves special mention. It is not often that a bland, unadorned, minimalist prose style is worth singling out, but in this case, the language is a perfect vehicle for the character and the setting. Although Ha Jin writes in English, he has domesticated the language to his own purposes. When the US prison guards converse with the Chinese prisoners, it is as if they are speaking a foreign language. That’s skilful writing. Ok, so this may not be the most obvious beach reading, but I think readers will appreciate having the authentic perspectives of such diverse cultures available in such readable and engrossing detail.